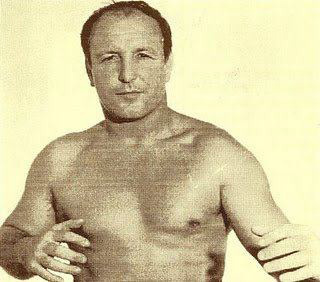 This powerful heavyweight billed from Charlotte, North Carolina, was a familiar figure on the British wrestling circuit in the late 1950s and early 1960s. Not everything was quite as it seemed as Ramon Napolitano was actually an Englishman who had been born in London in February, 1928. When he was three years old Ramon's family emigrated to Australia, where he lived until just prior to the outbreak of war in 1939, when the family returned to London. As a young teenager during the early 1940s Ray took an interest in wrestling, which had been very popular in Britain before the war. He was called up to the army in 1946, spending much of his time overseas in the Far East, Middle East, and Malta. It was whilst in the Far East that Ramon began wrestling professionally, using a pseudonym to protect his atatus as an amateur boxer. Ramon made his British debut in the early 1950s, though appearances were limited due to him serving in the Merchant Navy. In 1952 Ramon's travel bug took him to New York, in the country he was to call home. With his wanderlust and family members still in Britain the old country was never too far away and Ramon returned to Britain in September, 1958 and remained throughout much of 1958 and 1959, loing to Gideon Gidea at the Royal Albert Hall in October, 1959. 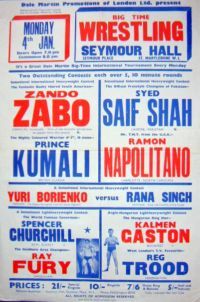 Ramon remained a familiar figure in British rings until 1966, our last recorded appearance being an appearance in the 1966 International Heavyweight Tournament at the Royal Albert Hall, eliminated by Judo Al Hayes. Ramon Napolitano was credited by Billy Two Rivers as the man who encouraged him to visit the UK. Ramon Napolitano, known here as Danny Knapp, passed away Sunday, July 14, 2013 in Winston-Salem. We'll miss seeing him sit in his chair, with barking little dogs on his lap, at his feet and on his shoulders as Danny spun another yarn. We'll miss his stories and his irreverent sense of humor. Born February 2, 1928, in Great Britain, Pawpaw served in the Seaforth Highlanders of the British Army in Korea, Manila, Jerusalem and locales in between. Danny came to the States and married Barbara Ruth Kennedy and had two children, Mark Knapp and Julie Helms. He was an adventurer, world traveler, pugilist, pro-wrestler, fitness fanatic, creator of historical artifacts and raconteur. He could hold a grudge with people, yet opened his home and his heart to small animals – squirrels, raccoons, dogs, chickens -- you name it. He will be missed by his children and grandchildren, Virginia Knapp Dorell, Sean Craig, Sarah Ellis, Rachel Knapp, Ron Craig, Mary Knapp, and Laura Knapp. His extended family in England includes sisters June, Marie, Nina and Anne, and brothers Nick, Tony and Ralph. He was predeceased by brothers John and David. The family asks that donations go to the Hospice and Palliative Care Center in Winston-Salem. Danny “Tinker Todd” Knapp, former Fabulous Kangaroo, your greatest adventure has just begun. Be reckless and give 'em hell! This obituary for Ramon Napolitano was provided by our Canadian friend, Bob Leonard. whom many readers will remember Bob as the Canadian correspondent for "The Wrestler" magazine.